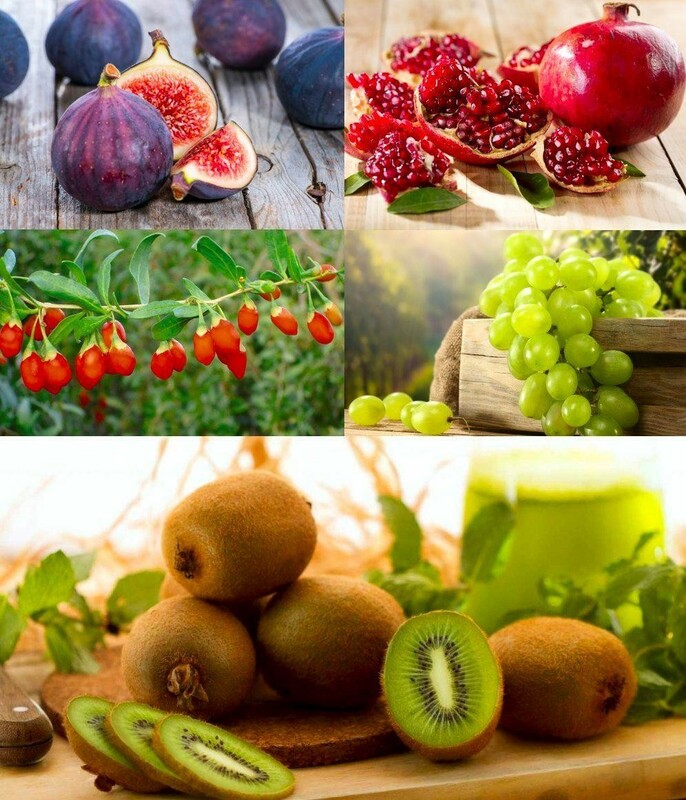 Growing your own healthy fruits is so easy, any one can do it, even you! Many people are put off thinking they need lots of space, but you don't even need a big garden to grow these and have your own tasty home grown treats. This special collection has been selected so you can even grow successfully on the patio or balcony in pots, although you can of course plant in the garden if you wish. The plants are lovely, and of fantastic quality, and all should be fruiting within a season of planting, that is if they are not fruiting and flowering already when they are delivered to you! That's right, these are not tiny seedlings, but established miniature bushes and trees many of which may even be fruiting when delivered, despite their small stature!!! Our collection features top quality plants in great varieties, you would think you can only grow these with great skill overseas, but that is not the case - you can really surprise your friends with your new found green fingered growing skills. All of these can be kept safely in tubs or planted in the garden. Pomegranate (Punica granatum) - Hailing from Persia, and cultivated through the ages in the Mediterranean region, this is regard as a symbol of fertility. The ancient Egyptians even considered it a life elixir. Pomegranates are a rich source of potassium, vitamin C and anti-oxidants. Figs (Ficus carica) - Forget those funny dried things you see around at Christmas, these are the luxury, fresh and juicy real deal and a source of vitamin C, calcium and iron too! Our gorgeous little fig tree, providing a compact version of a full sized specimen, has been grown to be a complete miniature plant and would be ideal for planting up in a container on the patio. It is of fruiting size, so if you have restricted space, like instant results, and have always wanted a fig tree, then this is for you. It would also make an ideal gift, and if you don't want to restrict it in a pot, you can simply plant it out in the garden, and allow it to grow into a full size tree. Kiwi Fruit (Actinidia) - If you like kiwi, then this one is for you! Producing tasty fruit, It is self-pollinating, so you only need one vine, it often bears fruit the first year after planting, too. In its native habitat of Asia, Actinidia can grow up trees but our variety is much more polite and much shorter and manageable! It prefers sun to part shade, average water & well-drained soil. The flowers are fragrant but inconspicuous, worth growing for its nice foliage alone. The fruits are an added bonus! Grapes (Vitis) - If you fancy a taste of Tuscany, try a grape vine! Very hardy and easy to grow, they will fruit readily in all areas of the UK, particularly if afforded a sunny sheltered position. Grape vines have been grown in Britain as far back as the Roman times. They are tough plants that don't take up much space and can be planted at the back of borders, along fences or climbing up pergolas, or simply in a pot on a framework of canes. Grapes need plenty of water too to make them swell, and the best thing is little and often. Once you've harvested them, why not make your own wine and impress friends and relatives with your very own vintage! As easy to grow as tomatoes! Plants are hardy down to -15C! All the above are delivered as high quality pot grown plants, special compact varieties that command a premium price, are guaranteed, and may even be fruiting on delivery! Each plant is individually supplied growing in its own container, of up to 2 litres in size subject to season. Grow in the garden or on your patio. They will do best in a bright position sheltered from the worst of the weather, but all can be grown safely outside all year round. Buy your amazing collection of special fruits today, as this offer probably won't last long!